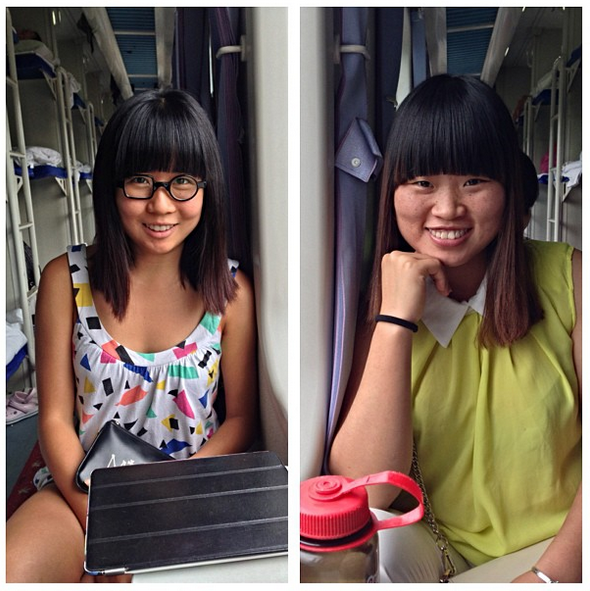 My first train ride was a 16-hour one from Xi An to Chengdu. It was to start at 2200h but by 2045h I was already waiting, ticket in hand, at Xi An’s main train station. (You can take the girl out of Singapore, but you can’t take the Singaporean out of the girl.) Suitcases and canvas bags and backpacks lay everywhere, worn as the brown tiled floor that had been aged by use and neglect. Much of it was hidden under the sprawl of people and their bulging luggage with goods – dry food, clothes, blankets – threatening to spill out of every compartment. The chatter of the crowd was punctuated by babies wailing. Mothers with tired eyes, a small child swaddled across their chests and two more toddlers in tow, tried to ease their tears. Families without allocated seats got in line for the train. 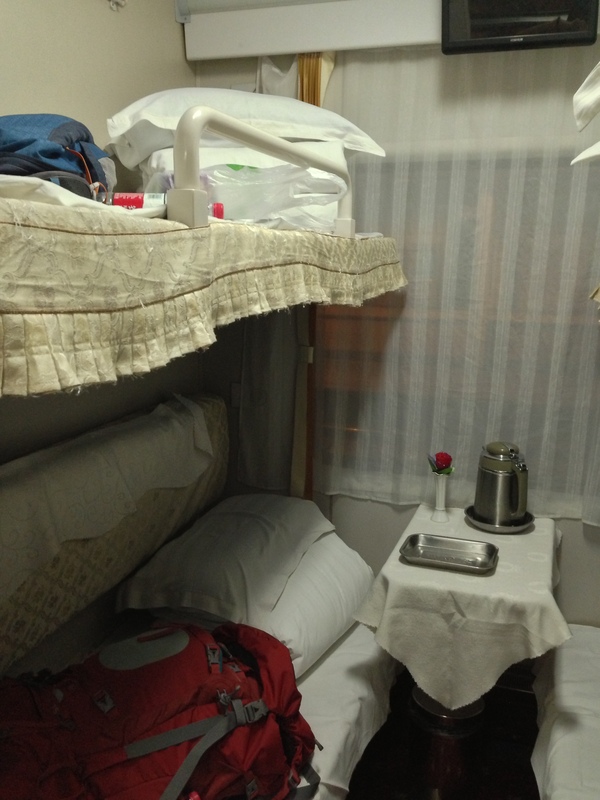 Train travel is divided into a few classes – soft and hard sleeper berths, hard seats, and standing tickets. All but the last category guarantees a bed, or a seat. Those with standing tickets are free to occupy any available space in the hard seat carriages, including any seat that happened to be unoccupied at that time. I would learn about this later, but on that first train journey, I was lucky enough to have booked a comfortable soft sleeper berth ahead of time. Four passengers to a cabin, and a sliding door that locked for added security – it was the first class ticket of most long-distance trains. I had no need to rush, so I sat and waited. Amidst the crowd, ticket sellers called out their offer: For ten yuan, they would speed up the boarding process for a passenger, allowing them to skip the queues and secure themselves (and their luggage) a comfortable ride. It was like a Disneyland fast pass, but I saw no one take it up. When the surly man next to me vacated his seat it was taken by 春仙. She was young (I would later learn that we were the same age) and traveling alone too, a newlywed on her way back to Yunnan after visiting her husband where he works in Inner Mongolia. Theirs is a permanent long-distance relationship. She took me under her wing for the duration of the train ride, showing me where to board, pointing out my carriage, and looking for me in the morning. I had brought all these things to keep me entertained – my iPad, travel journal and a Spotify playlist aptly named 16 Hours, but we ended up talking through the morning and afternoon. We had the same hairstyle and while I laughed at the coincidence, she called it fate (”可能这是缘分,“ she said). We shared our dreams, fears, aspirations. Her regrets of not mastering English in school were the same as mine when it came to Mandarin. She told me about her husband, and how she wasn’t ready to have kids even though their families were asking; I told her how Singaporean couples must get married before we can buy a house, and how my own long term relationship had ended less than six months ago. 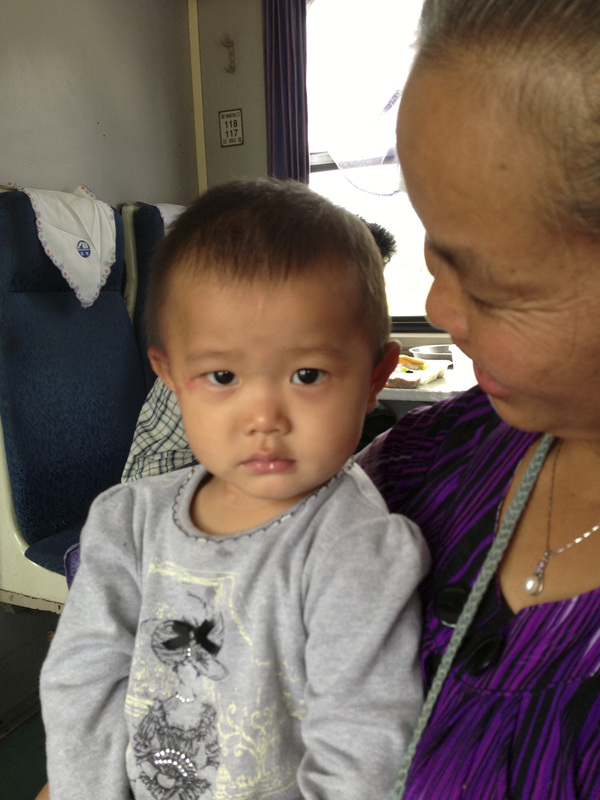 I didn’t take the train again until the end of my trip, from Kunming to Guilin. Almost a month of incident-free travel in China had lulled into complacency, and this time I didn’t think to book my train ride ahead of time. Summer meant much of the country was out on holiday too and domestic travel was in full swing, so when all the sleepers were taken I ended up with no choice but to book a hard seat for the 22-hour journey. Many people riding in the hard seat carriages were only doing short transits, about an hour or two each. So I ended up with a revolving door of seat buddies – the well dressed lady who told me about her visit to the stone forest in Yunnan (underwhelming, she said); the middle aged man in a wide brimmed hat who dropped a bottle of water on my head when he stood up to retrieve his bag from the overhead compartment. There was an old couple with their grandchild who rode the trains for free, because she was a cleaner and he used to service trains. Most of the time they took care of the boy, she told me, because his parents ran an internet cafe and were busy with work. It was not the first time I had heard of Chinese children being raised by their grandparents. But if it was tough for them, nobody showed it. ”还行“ was a refrain I heard many times. It’s okay, they meant, all the various people who said it to me, regardless of their circumstances. We can handle this. Later a girl no older than her twenties, who only had a standing ticket, tried to wedge herself into a sliver of empty space at the edge of my seat, squeezing me uncomfortably. I don’t like feeling the bare skin of my elbows and upper arms brushing against that of a stranger, but I hadn’t the heart to tell her to stand because who knew how long the rest of her journey was? And if I asked her how much longer she had to go, and if she was alright, would she just say, as they all did – ”还行“? Next Next post: GE2015: Empower your future?